SATURDAY, NOV. 24, 2018 AT THE FORUM IN INGLEWOOD, CALIF.
INGLEWOOD, CALIF. (Nov. 24, 2018): Tito Ortiz (20-12-1) of Huntington Beach, Calif. scored a first-round knockout victory against Chuck Liddell (21-9) of San Luis Obispo, Calif. in the third installment of their historic trilogy in front of 7,839 fans at the 'Fabulous' Forum in Inglewood, Calif. Ortiz dropped Liddell with a hard right hand and forced the referee to halt the fight after landing several more unanswered punches at 4:24 of the first round of their light heavyweight battle. "Woooooo! 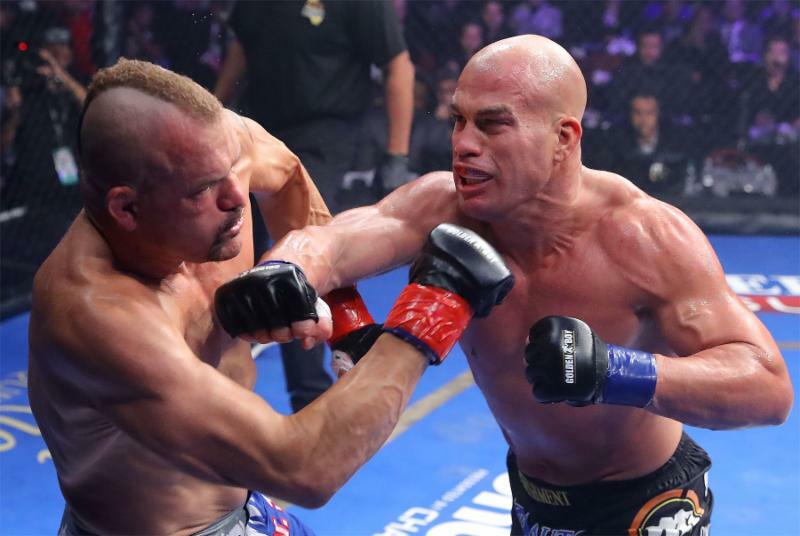 I want to give a shout out to my son Jacob, who I talked to on the phone - to my son Jesse, Jr. too," said Tito Ortiz. "I want you to know that dad loves you! I was so happy to get inside the ring. You know how much your dad works. I stopped him [Chuck]! I wanted this test! It just shows you don't take 8 years off and walk into my cage. Chuck, thank you for taking this fight. You pushed me so hard for all of these years and you made me work hard. I appreciate you. You are a real champ." "I wouldn't have made this comeback if I didn't feel like I was in great shape," said Chuck Liddell. "I made a mistake. I got caught. I came to give my best show. There are no excuses. I wanted to give my best performance, but I came up short. I'm going to have to sit back and really think about what's next." Light heavyweight Deron Winn (5-0) of Liberty City, Missouri went the distance and defeated Tom Lawlor (10-7) of Fall River, Massachusetts via three-round unanimous decision in the co-main event. Winn won with three scores of 30-27. "I just want to let LA know - mark your calendars. This is the day you witnessed a star be born. I really wanted to show off my power tonight," said Deron Winn. "Tom is a vet - he can run his mouth - but he's a tough fighter. For a guy like me, I knew I had to connect my punches to knock him out. After I landed a couple, I realized I was going to have to rumble with him. Oscar - I'm a free agent man!" Glesion Tibau (30-14) of Coconut Creek, Florida was victorious against Efrain Escudero (28-14) of Temple, Arizona via unanimous decision with three scores of 29-28 in a catchweight battle held at 160 pounds. "We were fighting one tough guy in there. It was really good matchmaking," said Glesion Tibau. "In the last round my couch screamed out - go and get that take down! I want to let Oscar De La Hoya know I am here!" Ricardo Palacios (11-1) of Mission, Texas scored a first round KO win against Waleel Watson (13-12) of San Diego, Calif. in a catchweight fight originally scheduled for three rounds. Palacios KO'd Watson at 3:56 of the aforementioned round. "People don't know how many obstacles you have to deal with to get to this point. I get all sentimental because some people don't understand how hard it is to live this life. But I have no excuses - I came to do my job," said Ricardo Palacios. "I didn't get a chance to watch any of his [Watson] videos to prepare, I just knew he was a bit lanky. At my gym we have great Southpaws and Muay Thai fighters that helped me get ready. I'm ready to go home and spend time with my three little ones." James Barnes (11-3) of Los Angeles, Calif. defeated Albert Morales (7-5-1) of Los Angeles, Calif. by submission via arm bar in the third round with time of 4:09 for a three-round bantamweight fight. "I thought I would finish him earlier honestly - he came at me like an amateur. He was intimidated by me. I can't wait to go back to Team Crush to get the next one. I just want to fight the top talent - I want to be tested and pushed to the limit," said James Barnes. Jay Silva (11-9) of Huntington Beach, Calif. stopped Oscar Cota (8-2) of Mexicali, Mexico via technical submission at 2:15 of the third round and final round of a bantamweight battle. "Oscar [Cota] was weak! I just left a massacre inside the cage," said Jay Silva. "I am so happy with my win - I just want to keep on fighting. I want Oscar De La Hoya to keep putting together MMA fights so that I can keep impressing him." Fernie Garcia (5-0) of Dallas, Texas scored a first-round submission win against Joe Roye (1-6) of St. Louis, Missouri in a featherweight fight originally scheduled for three rounds. Garcia submitted Roye with a rear naked choke at 2:48 of the aforementioned round. "It was a short night, as expected. Most of my professional fights have been ending like this," said Fernie Garcia. "I've been training with the best world class team in Texas - Coach Sayif has been working wonders with me. I feel unstoppable." Francisco Estrada (1-0) of St. Louis, Missouri defeated Jose Huerta (2-3) of Bell Gardens, California by submission via rear naked choke in a catchweight bout originally scheduled for three rounds. The fight was stopped at 2:47 of the second round. "I got caught in the middle of a little adversity, but I wasn't really hurt. Honestly, it turns me on being caught in tough situations. I knew I was coming in with a little less experience with it being my pro-debut, but I knew I just had to be patient," said Francisco Estrada. "I'm reppin' Fillmore! All I had to do was wait for the right moment to move in with the squeeze." Johnny Cisneros (12-6) of Laguna Niguel, Calif. defeated Dave Terrell (7-9) of Las Vegas, Nevada via unanimous decision with three scores of 30-26 in a catchweight bout. "It is freaking amazing to take home this win! I am extremely humbled and honored to take part in the first-ever MMA card that Golden Boy has put together," said Johnny Cisneros. "I hope that they choose me to be on their cards in the future. My opponent was HUGE - but I was confident with my training and worked with much bigger guys in the gym in preparation for this." Joseph Henle (11-4-1) of Ventura, Calif. stopped Keith Berry (15-14-1) of Temecula, Calif. in the first round by submission via rear naked choke in a catchweight fight originally scheduled for three rounds. Joshua Jones (8-3) of Long Beach, Calif. defeated Craig Wilkerson (7-5) of Newport Beach, Calif. via unanimous decision in a three-round welterweight fight. Jones won with three scores of 30-26. The night started with a series of amateur bouts with state titles on the line for each fight. Noah Christy (5-1) of Huntington Beach, Calif. defeated Casey Smith (4-3) of Costa Mesa, Calif. via unanimous decision with scores of 29-28, 30-26, 30-26 in a three-round middleweight bout. Josh Wang Kim (15-1) of San Diego, Calif. stopped Johnny Robles (7-3) of Downey, Calif. via TKO in the second round with a time of 1:56 in a featherweight bout originally scheduled for three rounds. Mary Almario (4-1) of Stanton, Calif. scored a three-round unanimous decision win against Tyler Schafer (3-2) of San Diego, Calif. All judges scored it 29-28 for Almario in this flyweight bout. John Wang Kim (15-1) of San Diego, Calif. beat Mauro Gutierrez (6-3) of San Clemente, California via split decision in a three-round bantamweight bout. One judge scored the fight 28-29 for Gutierrez, while two others scored it the same for Kim. Julianna Miller (8-0) of Alpine, California defeated Sidney Trillo (2-1) of Anaheim, California via unanimous decision in a three-round strawweight battle with scores of 29-28, 29-28, and 29-27. Liddell vs. Ortiz 3 was a three-round light heavyweight fight presented by Golden Boy Promotions. The event is sponsored by Fred Loya Insurance, FITE.TV and Casa Mexico Tequila. The fights took place on Saturday, Nov. 24, 2018 at the 'Fabulous' Forum in Inglewood, Calif.
For more information, visit www.goldenboypromotions.com. Photos and videos are available to download by clicking here or by copying and pasting link: http://bit.ly/LiddellOrtizIII into a browser. Credit must be given to Golden Boy Promotions for photos and videos used.